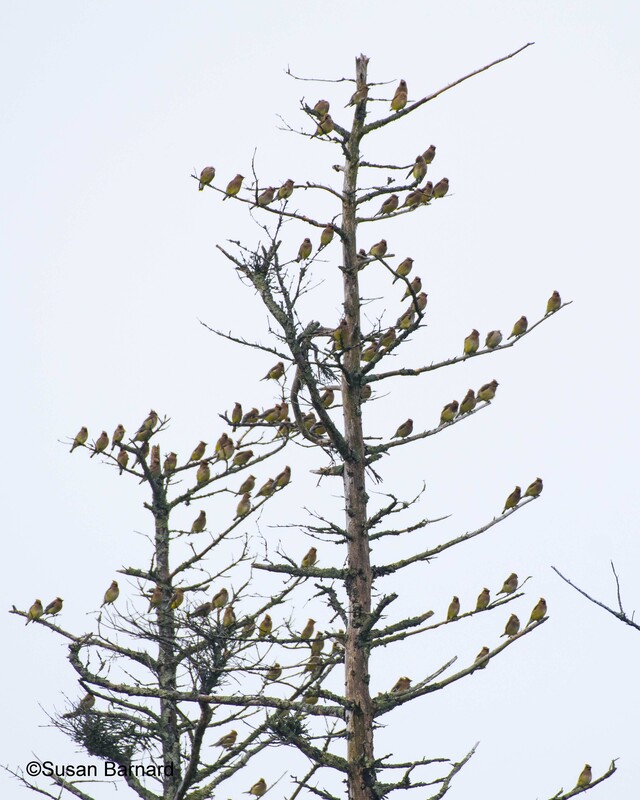 The most abundant songbird throughout the weekend, a flock of 125 Cedar Waxwings would ball up each morning and then spread out through the island to feed. My annual “Monhegan Spring Migration Weekend” battled highs seas (seriously, it was rough and we were all thankful it was only a 1-hr ride!) to arrive on the wonderful island of Monhegan on Friday, May 25th. 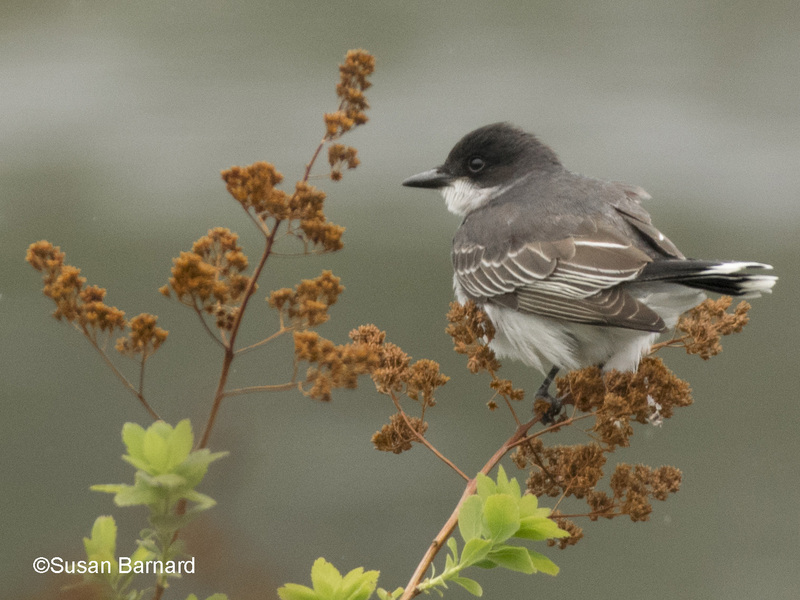 Five days later, I had two new birds for my Monhegan list, a total of 97 species including 18 species of warblers, and way too much of the best pizza in Maine. Friday calmly eased us into the weekend, but Saturday blew us away. It was just one of those great days, with birds seemingly everywhere, and many of them low and easy to see. Following a moderate flight overnight on light westerly winds, there were a lot of new arrivals. Five Tennessee Warblers heard singing from one spot while tarrying at the Trailing Yew awaiting the coffee pot were a sign of things to come. 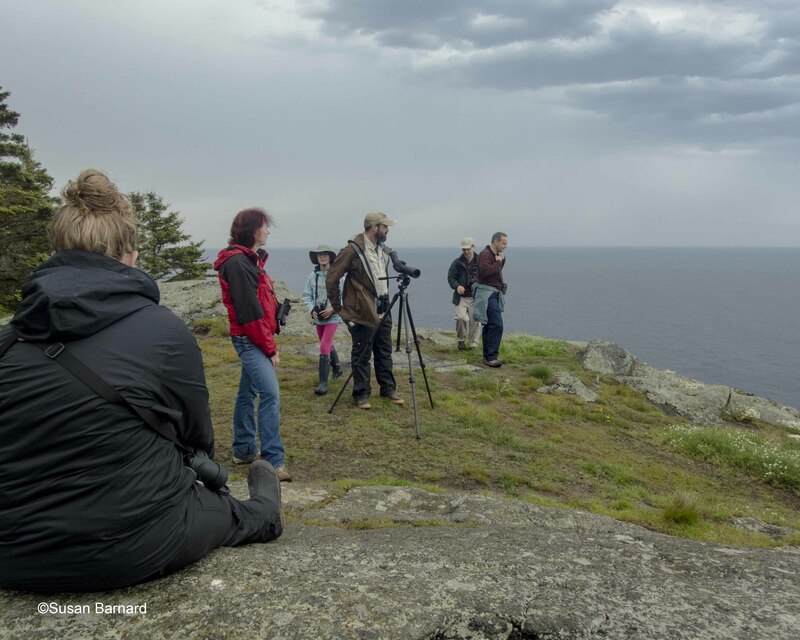 While it wasn’t the kind of day that Monhegan legends are made of, it was one of the “good ol’ days” where migrants were plenty, views were crippling, and birding was easy. And all of that was punctuated by a few goodies, including an immature male Orchard Oriole, three Eastern Bluebirds together (two appeared to leave the island shortly thereafter), a lingering immature Great Cormorant, my first Common Nighthawk of the year fluttering off the high cliffs of White Head, 14 species of warblers including 4 Cape May and 2 Bay-breasted, and much more. And the day ended with two American Woodcocks heard calling and twittering from the lawn chairs of the Trailing Yew. That’s what Monhegan in migration is all about! 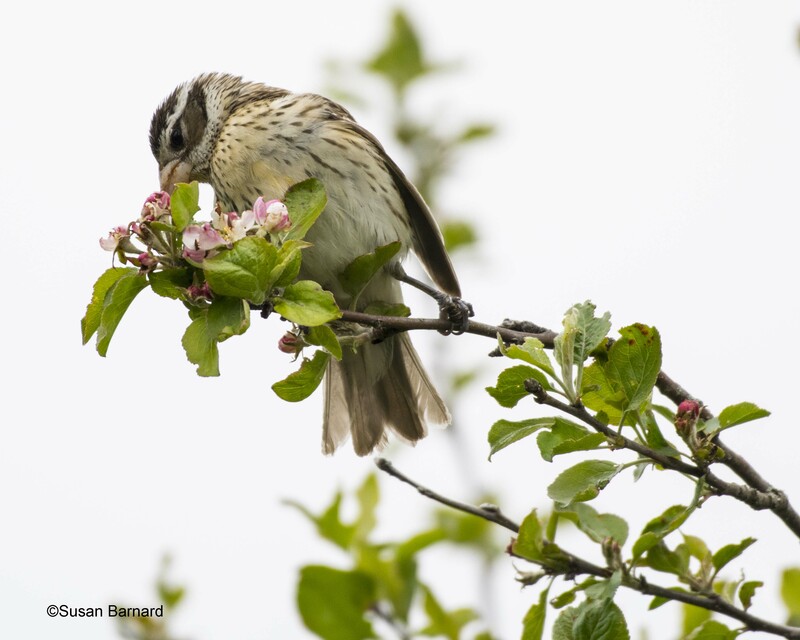 On Monhegan and elsewhere, a good birding rule of thumb is that if you see a blooming apple tree, you should look in it. And that sunset from the Yew! Not surprisingly, Sunday was slower, as light northeasterly winds precluded much in the way of overnight migration. And while it seemed that a lot of yesterday’s migrants had departed or melted into the woodlands, there were plenty of birds around, with a slight improvement in diversity, still plenty of Blackpoll Warblers, and a few highlights including a cooperative Green Heron, more Red Crossbills, a fly-by Black-billed Cuckoo, a Carolina Wren (finally; good to know one is here again), and a Northern Mockingbird (uncommon to rare out here) that we witnessed fly onto the island from behind, or perhaps over, Manana. 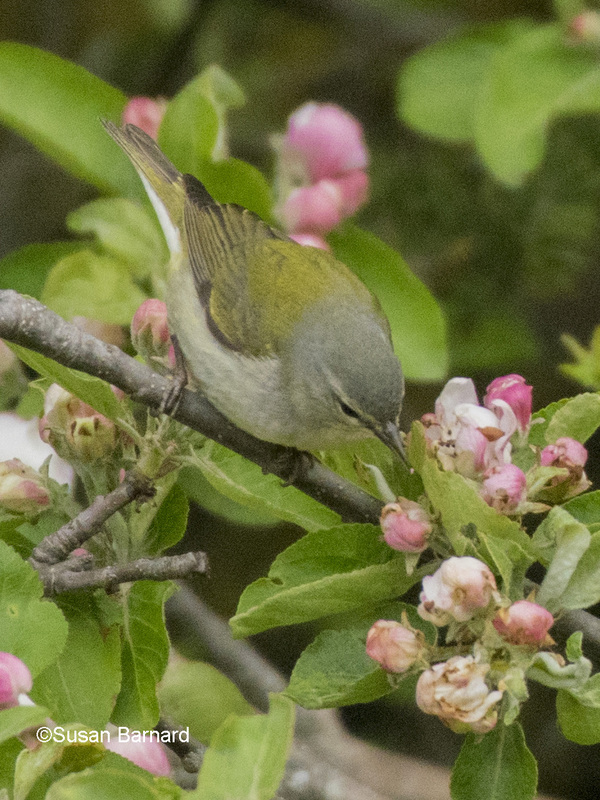 The afternoon was rather slow overall, but we just kept seeing birds well: the Warbling Vireo at eye level, a Lincoln’s Sparrow in the garden, and continued good views of Tennessee Warblers. Monday the 28th was the last day of the tour, and with a smaller group in tow, we covered a lot of ground. While there was virtually no visible migration on the radar overnight on very light easterly winds once again, there were clearly a lot of new birds around (or at least, birds not seen the previous days) and we ended up with the best diversity of the trip – 71 species by day’s end. …a Brown Thrasher, a Red-bellied Woodpecker, Sharp-shinned Hawk, and especially the Brant that we found on Nigh Duck – my 211th all-time bird on Monhegan, and a new “island bird” for just about every birder on the island. On Tuesday, it was just Jeannette and I on a one-day vacation, mostly on our own, but meandering in and out of contact with several friends on the island. We awoke to dense fog, but that rapidly lifted, and the strong (for the date) flight overnight produced another new arrival of birds. It sure wasn’t Saturday, but there were plenty more Blackpoll Warblers around, and warbler diversity overall was the best of the weekend with a total of 16 species, highlighted by the Mourning Warbler we found by the Mooring Chain, and an impressive 15 Blackburnian Warblers. …and we added a few new birds for the trip list including Great-crested Flycatcher, Northern Flicker, and had more species of butterflies today than total butterfly individuals all weekend, including an early Monarch. It was also a really, really nice day! The afternoon was slower, and Jeannette and I winded down our visit with good conversation, one last slice (or two) of Novelty pizza and another pint (or two) of Monhegan Brewing beer, and caught up with some good friends who had just arrived with tours of their own. It was a relaxing finish to a great weekend, and the gentle boat ride home was more relaxing than we really needed before driving – just a little different than our outbound trip! So yeah, it was a good trip. And, after one day at work, I am definitely ready to go back! At least I have two tours out here this fall. First, I have a full week with my WINGS tour, space on which is still available. 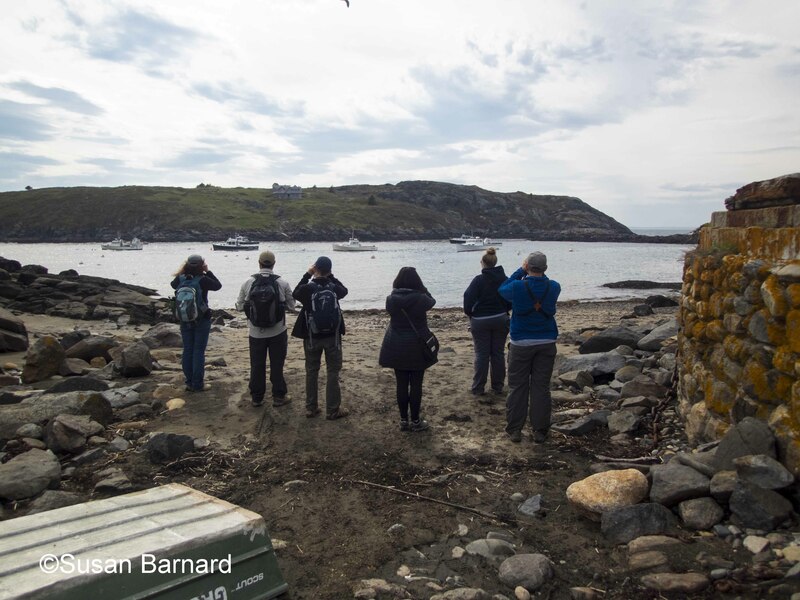 And there’s a little room left on our store’s annual Monhegan Fall Migration Weekend tour, which is only four months away! Yellow Warbler in an apple tree. I forgot to take a photo of the pizza – I ate it too quickly as usual – so here are some beautiful beets from the Island Inn. 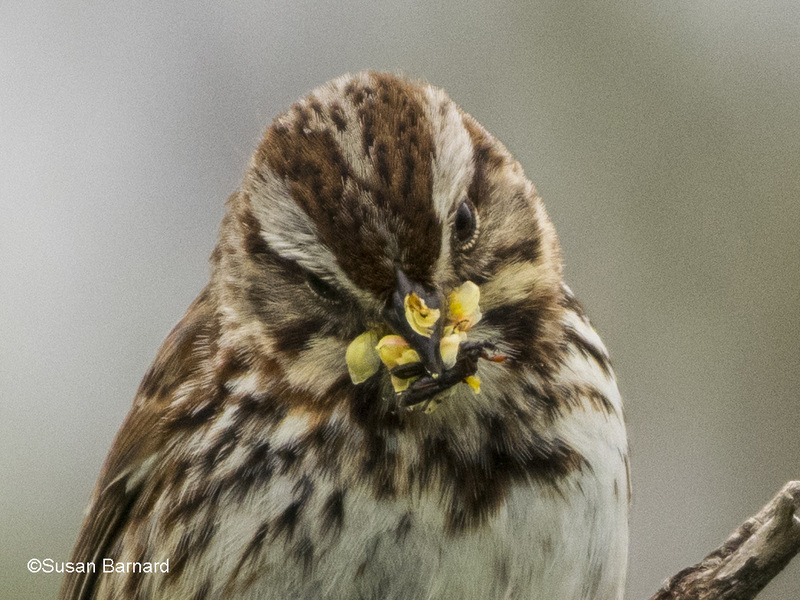 And as migrants were passing through, many of the island’s breeding species were well underway, such as this Song Sparrow gathering food for its nestlings. This entry was posted in Birding in Maine, Private Guiding and Tours and tagged "Birds, Birding, Blackburnian Warbler, Blackpoll Warbler, Brant, Cedar Waxwing, Freeport Wild Bird Supply, migration, Monhegan, Monhegan Island, Monhegan Migration Weekend, Red Crossbill, Summer Tanager, Tours, travel, trips, warblers on June 1, 2018 by Derek.